The United States Coast Guard (USCG) has published its Annual Port State Control (PSC) Report and Annual Class Performance List for 2017. The report provides key statistics related to enforcement of international requirements with regard to foreign flag vessels calling in US ports as well as on the safety performance of Flag States and Recognized Organizations. Basis the published performance results for the year 2017 and the 3-year rolling period 2015-2017 relevant to Class societies, INSB Class remained for a 5th consecutive year in the top performing group of class societies with a detention ratio of 0%. 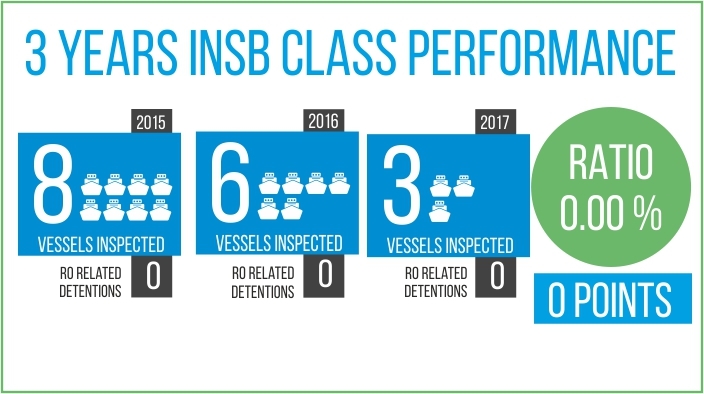 In 17 individual vessel examinations received in the period 2015 to 2017 (distinct arrivals), INSB Class was not attributed with any RO related detention and thus continues its unbroken presence amongst the top performers in the USCG Port State Control Reports, since 2013. INSB Class consistent positive PSC performance highlights its commitment to applying safety norms and verifying compliance for its certified fleet. INSB Class shall continue to demonstrate an increased focus and care with regards to the application and verification of applicable safety norms to ensure that its register fleet continues to meet required IMO safety regulations and INSB Class Rules, with the aim for sustained Quality Shipping and safer seas. Since 2006, INSB Class remains approved by the United States Coast Guard (USCG) for Classification Society activities under 46 CFR part 2, subpart 2.45 , in reflection of its commitment to achieve ever-higher standards.